Openly accessible scholarly literature is referred to as “the fabric and the substance of Open Science” in the present small grant proposal, submitted to the Open Science Prize contest and published in the Research Ideas and Outcomes (RIO) open access journal. However, the scholarly literature is currently quite chaotically dispersed across thousands of different websites and disconnected from its context. To tackle this issue, authors Marcin Wojnarski, Paperity, Poland, and Debra Hanken Kurtz, DuraSpace, USA, build on the existing prototype Paperity, the first open access aggregator of scholarly journals. Their suggestion is the first global universal catalog of open access scientific literature. It is to bring together all publications by automatically harvesting both “gold” and “green” ones. 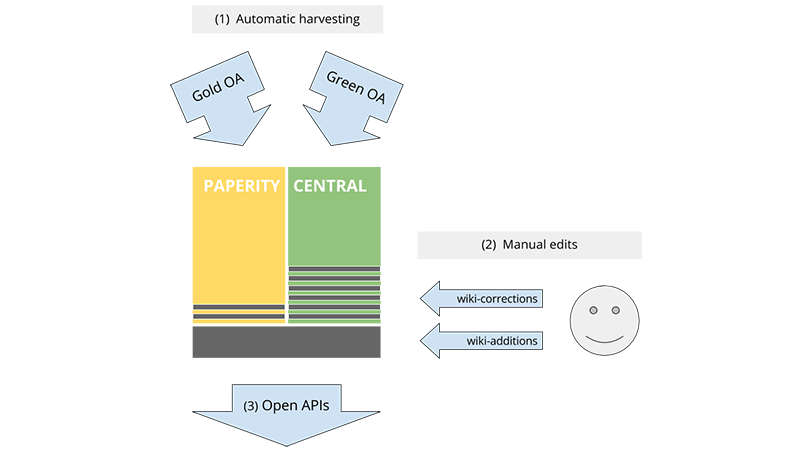 Called Paperity Central, it is to also incorporate many helpful functionalities and features, such as a wiki-type one, meant to allow for registered users to manually improve, curate and extend the catalog in a collaborative, community-controlled way. “Manual curation will be particularly important for “green” metadata, which frequently contain missing or incorrect information; and for cataloguing those publications that are inaccessible for automatic harvesting, like the articles posted on author homepages only,” further explain the authors. To improve on its ancestor, the planned catalog is to seamlessly add “green” publications from across repositories to the already available articles indexed from gold and hybrid journals. Paperity Central is to derive its initial part of “green” content from DSpace, the most popular repository platform worldwide, developed and stewarded by DuraSpace, and powering over 1,500 academic repositories around the world. All items available from Paperity Central are to be assigned with globally unique permanent identifiers, thus reconnecting them to their primary source of origin. Moreover, all different types of Open Science resources related to a publication, such as author profiles, institutions, funders, grants, datasets, protocols, reviews, cited/citing works, are to be semantically linked in order to assure none of them is disconnected from its context. Furthermore, the catalog is to perform deduplication of each entry in the same systematic and consistent way. Then, these corrections and expansions are to be transferred back to the source repositories in a feedback loop via open application programming interfaces (APIs). However, being developed from a scratch, its code will possess many distinct features setting it apart from existing wiki-type platforms, such as Wikipedia, for example. In order to guarantee the correctness of the catalog, Paperity Central is to be fully transparent, meaning the history of changes is to be made public. Meanwhile, edits are to be moderated by peers, preferably journal editors or institutional repository admins overlooking the items assigned to their collections. In their proposal, the authors note that the present development plan is only the first phase of their project. They outline the areas where the catalog is planned to be further enhanced in future. Among others, these include involvement of more repositories and platforms, fully developed custom APIs and expansion on the scholarly output types to be included in the catalog. “If we are serious about opening up the system of scientific research, we must plant it on the foundation of open literature and make sure that this literature is properly organized and maintained: accessible for all in one central location, easily discoverable, available within its full context, annotated and semantically linked with related objects,” explain the scientists. In the spirit of their principles of openness, the authors assure that once funded, Paperity Central will be releasing its code as open source under an open license.